Our holy Father Alexis, the defender of the Orthodox Faith and zealous worker in the Lord’s vineyard, was born in Austro-Hungary on March 18, 1854 into a poor Carpatho-Russian family. Like many others in the Austro-Hungarian empire, the Toths were Eastern Rite Catholics. Alexis’ father and brother were priests and his uncle was a bishop in the Uniate church. He received an excellent education and knew several languages (Carpatho-Russian, Hungarian, Russian, German, Latin, and a reading knowledge of Greek). He married Rosalie Mihalich, a priest’s daughter, and was ordained on April 18, 1878 to serve as second priest in a Uniate parish. His wife died soon afterwards, followed by their only child—losses which the saint endured with the patience of Job. In May, 1879, Father Alexis was appointed secretary to the Bishop of Presov and also Administrator of the Diocesan Administration. He was also entrusted with the directorship of an orphanage. At Presov Seminary, Father Toth taught Church History and Canon Law, which served him well in his later life in America. Saint Alexis did not serve long as a professor or an administrator, for the Lord had a different future planned for him. In October, 1889 he was appointed to serve as pastor of a Uniate parish in Minneapolis, Minnesota. Like another Abraham, he left his country and his relatives to fulfill the will of God (Gen 12:1). Upon his arrival in America, Father Alexis presented himself to the local Roman Catholic diocesan authority, Archbishop John Ireland, since there was no Uniate bishop in America at that time. Archbishop Ireland belonged to the party of American Catholics who favored the “Americanization” of all Roman Catholics. His vision for the future was founded on a common faith, customs, and the use of the English language for everything except liturgical celebrations. Naturally, ethnic parishes and non-Latin rite clergy did not fit into this vision. Thus, when Father Toth came to present his credentials, Archbishop Ireland greeted him with open hostility. He refused to recognize him as a legitimate Catholic priest or to grant permission for him to serve in his diocese. As a historian and professor of Canon Law, Father Toth knew his rights under the terms of the Unia and would not accept Archbishop Ireland’s unjust decisions. In October of 1890, there was a meeting of eight of the ten Uniate priests in America at Wilkes-Barre, Pennsylvania under the chairmanship of Father Toth. By this time the American bishops had written to Rome demanding the recall to Europe of all Uniate priests in America, fearing that Uniate priests and parishes would hinder the assimilation of immigrants into American culture. Uniate bishops in Europe refused to listen to the priests’ pleas for help. Archbishop Ireland sent a letter to his parishes ordering their members not to attend Father Toth’s parish nor to accept any priestly ministrations from him. Expecting imminent deportation, Father Toth explained the situation to his parishioners and suggested it might be best for him to leave and return to Europe. This initiative came from the people themselves, and was not the result of any coercion from outsiders. The Russian Orthodox Church was unaware of the existence of these Slavic Uniate immigrants to America, but responded positively to their petition to be reunited to the Orthodox Church. The example of Saint Alexis and his parish in returning to Orthodoxy was an encouragement to hundreds of other Uniates. The ever-memorable one was like a candle upon a candlestick giving light to others (Mt.5:15), and his flock may be likened to the leaven mixed with meal which leavened the whole (Mt.13:33). Through his fearless preaching he uprooted the tares which had sprung up in the wheat of true doctrine, and exposed the false teachings which had led his people astray. Although he did not hesitate to point out errors in the doctrines of other denominations, he was careful to warn his flock against intolerance. His writings and sermons are filled with admonitions to respect other people and to refrain from attacking their faith. While it is true that he made some strong comments, especially in his private correspondence with the church administration, it must be remembered that this was done while defending the Orthodox Church and the American Mission from unfounded accusations by people who used much harsher language than Father Toth. His opponents may be characterized by intolerance, rude behaviour, unethical methods and threats against him and his parishioners. Yet, when Father Alexis was offended or deceived by other people he forgave them, and he would often ask his bishop to forgive his omissions and mistakes. In the midst of great hardships, this herald of godly theology and sound doctrine poured forth an inexhaustible stream of Orthodox writings for new converts, and gave practical advice on how to live in an Orthodox manner. For example, his article “How We should Live in America” stresses the importance of education, cleanliness, sobriety, and the presence of children in church on Sundays and Holy Days. Although the Minneapolis parish was received into the Orthodox Church in March, 1891, it was not until July, 1892 that the Holy Synod of Russia recognized and accepted the parish into the Diocese of Alaska and the Aleutians. This resolution reached America only in October, 1892. During that time there was a climate of religious and ethnic hostility against the new converts. Father Alexis was accused of selling out his own Carpatho-Russian people and his religion to the “Muscovites” for financial gain. In reality he did not receive any financial support for a long time, for his parish was very poor. Until his priestly salary began to arrive from Russia, the righteous one was obliged to work in a bakery in order to support himself. Even though his funds were meager, he did not neglect to give alms to the poor and needy. He shared his money with other clergy worse off than himself, and contributed to the building of churches and to the education of seminarians in Minneapolis. He was not anxious about his life (Mt.6:25), what he would eat or drink or wear. Trusting in God to take care of him, Saint Alexis followed the admonition of Our Savior to “seek first the kingdom of God and His righteousness, and all these things shall be added to you” (Mt.6:33). So he bore the tribulation, slander, and physical attacks with patience and spiritual joy, reminding us that “godliness is stronger than all” (Wisdom of Solomon 10:12). 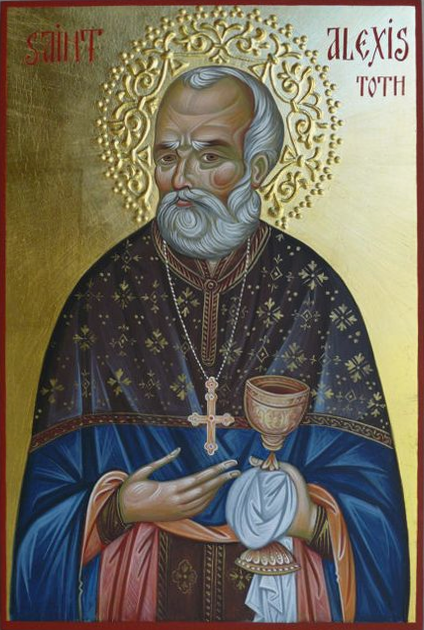 Bishops Vladimir, Nicholas, Saint Tikhon, and Platon recognized the special gifts of Father Toth, so they often sent him forth to preach and teach wherever there were people of Slavic background. Even though he was aware of his shortcomings and inadequacies, yet he was obedient to the instructions of the bishops. He did not hesitate or make excuses, but went immediately to fulfill his mission. Saint Alexis visited many Uniate parishes, explaining the differences between Orthodoxy, Protestantism, Roman Catholicism and Uniatism, stressing that the true way to salvation is in Orthodoxy. Like Josiah, “he behaved himself uprightly in the conversion of his people” (Sir 49:2). He was instrumental in the formation or return of seventeen parishes, planting a vineyard of Christ in America, and increasing its fruitful yield many times over. By 1909, the time of his blessed repose, many thousands of Carpatho-Russian and Galician Uniates had returned to Orthodoxy. This was a major event in the history of the North American Mission, which would continue to shape the future of Orthodoxy in this country for many generations to come. Any future growth or success may truly be regarded as the result of Father Toth’s apostolic labors. Who can tell of the saint’s spiritual struggles? Who can speak of the prayers which his pious soul poured forth unto God? He did not make a public display of his piety, but prayed to God in secret with all modesty, with contrition and inward tears. God, Who sees everything done in secret, openly rewarded the saint (Mt.6:6). It is inconceivable that Saint Alexis could have accomplished his apostolic labors unless God had blessed and strengthened him for such work. Today the Church continues to reap the fruits of his teaching and preaching. Father Toth’s efforts did not go unrecognized in his own lifetime. He received a jeweled miter from the Holy Synod, as well as the Order of Saint Vladimir and the Order of Saint Anna from Czar Nicholas II for distinguished service and devotion to God and country. In 1907, he was considered as a candidate for the episcopal office. He declined this honor, however, humbly pointing out that this responsibility should be given to a younger, healthier man. In January, 1993 a certain man prayed to Saint Alexis to help him obtain information about his son from whom he had been separated for twenty-eight years. Placing his confidence in the saint’s boldness before God, he awaited an answer to his prayer. The very next day the man’s son telephoned him. It seems the young man was in church when he was suddenly filled with an overwhelming desire to contact his father. He had been taken to another state by his mother, and she changed his name when he was a child. This is why his father was unable to locate him. Having learned from his mother that his father was an Orthodox Christian, he was able with the help of an Orthodox priest to obtain his father’s phone number in a distant city. As a result of that telephone call, the young man later visited his father, who rejoiced to see what sort of man his son had become. The father gave thanks to God and to Saint Alexis for reuniting him with his son. Saint Alexis was a true man of God who guided many Carpatho-Russian and Galician immigrants through the dark confusion of religious challenges in the New World and back to the unity of the Orthodox Church through his grace-filled words and by his holy example. In his last will and testament Saint Alexis commended his soul to God’s mercy, asking forgiveness from everyone and forgiving everybody. His holy relics now rest at Saint Tikhon Monastery in South Canaan, Pennsylvania where the faithful may come to venerate them and to entreat Saint Alexis’ intercessions on their behalf.